Cubs As The Cardinals Competition: Yay or Nay? 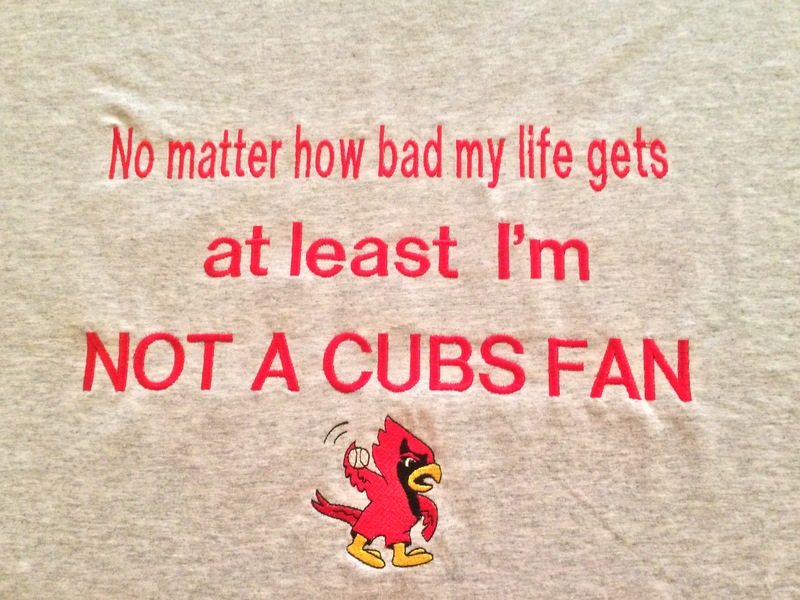 Another Cardinals vs. Cubs series begins in about 15 minutes, and I’ve prepared myself by donning the appropriate attire — this new t-shirt I received from a coworker about a week ago. Awesome, isn’t it? For me personally, it would be better if it had the word “anymore” at the end (and that complete story, if you don’t know and do care, is available in the About section) but my story is certainly a rarity. Cardinals fans become Cardinals fans and stay that way; Cubs fans become Cubs fans and stay that way. It’s also rare that series between the two teams are actually of any baseball significance. Sure, the rivalry is usually important to fans — for bragging rights or trash-talking or the chance to be obnoxious to that rival fan you know or are related to (which, in my case, is a pretty large number). Yes, there was that important Three Nights in August series back in 2003 though the season ultimately ended up with the Cardinals at home in October, plus Cards fans will always fondly remember Carlos Marmol and his role in 2011’s magical September run to the wild card. Yet this year is different. We’ve heard since Joe Maddon was hired as Cubs manager that THIS IS IT!!!! for the Cubbies, and the hype has just continued on. To be fair, their performance has been good enough to give them the fourth-best record in the majors — though just the third-best in the National League Central — and firmly into the second wild card spot. But I’m not sure the hype has matched the accomplishment thus far. And — how fun is this? — there’s a realistic chance that the winner of the Pirates-Cubs wild card game will face the Cardinals in the NLDS. Please excuse my caps lock but COULD YOU IMAGINE IF THE CARDS PLAYED THE CUBS IN THE PLAYOFFS? Ugh. Fun? No way, not at all. Nauseating would be my choice of descriptor for that NLDS — about a billion times more nauseating than it was for the Cards to face the Pirates two years ago. The media hype would be so over-the-top — but firmly focused on those Cubbies. The Cardinals would be the Big Bad Guys That Everyone Hates even more than they usually are each postseason … even before they’d win and advance to the NLCS. My friend Michael is a lifelong Cubs hater (and of course Cardinals fan), and his perfect season would be the Cubs going 0-162. The more this season goes along, the more I’d like that too. Because, living in the Quad Cities and closer to Chicago than St. Louis, I have to deal with the plethora of bandwagon Cubs fans who haven’t really made an appearance since 2008. Never mind that they couldn’t tell me where Joe Maddon managed before 2015, that they just learned Jake Arrieta’s name last week when he threw a no-hitter and can’t name even 10 guys on the roster. They can tell me how badly the Cubs are going to beat the Cardinals and how awesome it’s going to be, and that’s all that matters to them. I do know decent Cubs fans. I’m related to a few and have been friends with some for many years now. Sure, it would be nice if some time their long, and long-suffering, fandom was rewarded and they’d get to experience the thrills of October and what it feels like to have your team become World Series champions — something I’ve experienced twice in the 16 seasons I’ve now been a Cardinals fan. But not now. Not this year. There’s nothing fun to me (and to Michael, and to countless other Cardinals fans) about a good Cubs team. Well, except when they lose to the Cardinals. This entry was posted in 2015 Cardinals and tagged Cubs, Rivalries by Christine Coleman. Bookmark the permalink.